JBL has announced a series of speakers that feature music enhancing technology. The JBL Authentics L16 and L8 have been designed to give users high quality audio from a range of devices. 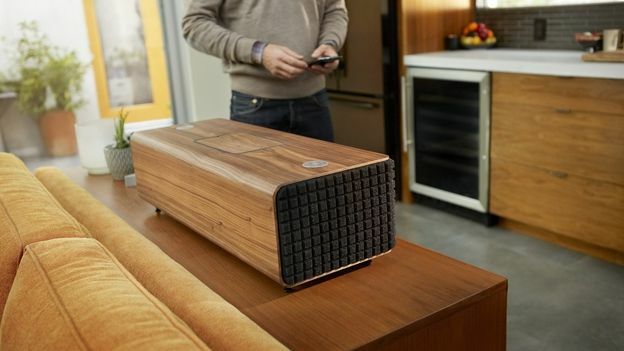 Both speakers in the series feature AirPlay, DNLA, NFC and Bluetooth connectivity. The L16 and L8 support studio quality streaming at 24-bit/96kHz audio. That's significantly higher than the 16-bit/44.1kHz quality you'll find in most speaker systems. Both of the speakers come with Harman Clari-Fi technology. According to JBL, it has the ability to restore detail lost due to compression techniques used in modern digital music. This can be controlled via the free JBL Music app, which is available for most tablets and smartphones. In terms of differences between the two speakers, the L16 comes with a walnut-veneer case and has six 50W amplifiers and speakers. The L8 on the other hand comes in a wooden gloss black box and features four 30W amps. Both of the speakers are available now. The JBL Authentic L16 is available now for a recommended price of £900 while the JBL Authentic L8 will sell for £500.